This tutorial shows what to do with your Quick Macros registration code. 1. When you buy a Quick Macros license, you receive an email message with your registration code. The code looks like XXXXXXXXXXXXXXXXXXXXXXXXXXXXXXXX-Your%20Name. Select it and copy to the clipboard (right click, and click Copy). If the code is in 2 or more lines, copy all lines. 2. Open Quick Macros window. To open it, click the tray icon by the clock. If the icon is not shown, click Start -> Programs -> Quick Macros 2 -> Quick Macros. 3. In the Quick Macros window, click menu Help -> Registration. 4. 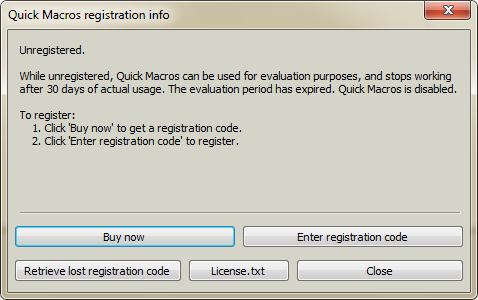 It opens "Quick Macros registration info" dialog. 5. 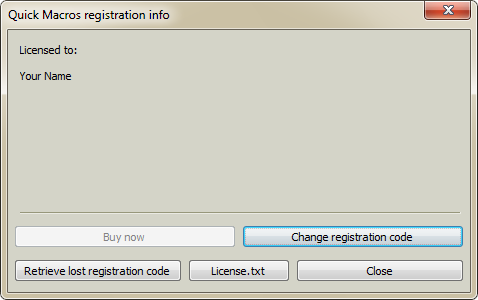 In the dialog, click "Enter registration code". It opens "Registration" dialog. Click "Paste". Make sure that the edit field contains your registration code. 8. 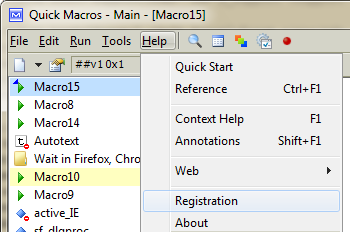 When Quick Macros restarts, open the "Quick Macros registration info" dialog (menu Help -> Registration). You should see your registration name in it. If so, Quick Macros is unlocked and working without any limitations. 9. If it still says "Unregistered", probably the registration code you entered was incorrect. Try to enter the registration code again. Possibly it is corrupted when sending by email. If it is broken into two lines, copy/paste both lines. You can retrieve correct registration code here. If your Quick Macros version is below 2.2.0, please upgrade. 10. If you use third-party commercial macros, you may also need to buy license to use them. In this case, when you run a macro, it may show another registration dialog. We don't provide support regarding to registering and using commercial macros. Please contact the author of the commercial macros.